Alice goes with her sister to a picnic and then she falls asleep and starts dreaming about a wonderland full of talking animals and walking playing cards. 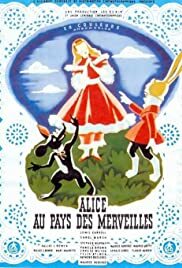 Better known for being suppressed by Disney to protect their 1951 production, this co-French/British production is surprisingly successful at capturing Carroll's logical nonsense. A prologue with author Dodson/Carroll, Alice and her sisters, and a visit by Queen Victoria (splendidly played by Pamela Brown) sets up amusing "clues," a la the Kansas scenes in THE WIZARD OF OZ. The main story is told with a live Alice moving through painted sets and wonderful pixilated puppets. There's real eccentric charm and fun in many of the sequences, the fish-footmen are particularly funny with a Gilbert & Sullivan style number to match. Sadly, the "Ansco" color has apparently gone to rack and ruin, but the intentions can at least still be seen. Still, it comes closer to an acceptable Carroll then most adaptations.